Spain is one of my favourite countries to visit because I love the culture, the food and the landscape. When I was invited to explore the region of Costa Barcelona I knew I had to accept, and I was excited to explore this region of Spain from the outset. I’m also really excited to share with you what I discovered and I don’t think you will be disappointed! Before I get into all the fantastic things we got to see and do in Costa Barcelona, I have a confession to make! Costa Barcelona wasn’t a region I was particularly familiar with before this trip if I’m honest. I had to look it up and do some research as I thought perhaps Costa Brava had changed it’s name or something else had happened with Spanish geography that I wasn’t aware of. It sounds silly doesn’t it, but since I’ve visited Costa Barcelona and have shared pictures and updates across Facebook, Twitter and Instagram I’ve realised that there are lots of my followers that also don’t appreciate that Costa Barcelona is a region of Spain beyond the famous city of Barcelona. Many of the comments I’ve received assumed that during Costa Barcelona Week as it was called, we were located in the city, when the truth is we drove through it only once during our stay. 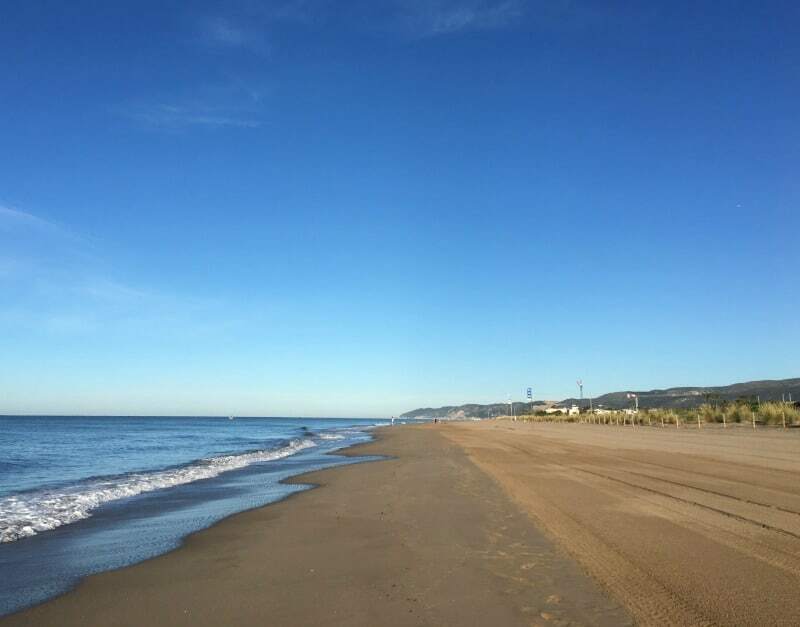 The region of Costa Barcelona actually covers around 100 kilometres of coast line either side of Barcelona spanning from Malgrat de Mar in the north to Vilanova i la Getrú in the south. Costa Barcelona is in Catalonia which renowned for providing tourists with rich cultural experiences, plenty of fun holiday activities to do and stunning beaches. We spent 4 days exploring this region of Spain and I’m pleased to say the Costa Barcelona weather didn’t let us down during our visit in May. I really felt like I got to experience what makes Costa Barcelona such a beautiful place to visit and I really would urge you to consider doing some, if not all of these activities, to make the most of your holiday in this beautiful part of Spain. For our 4 day visit we stayed at the AC Hotel Gava Mar just south of Barcelona. It’s a very short transfer from Barcelona El-Prat Airport and provides excellent access to the region of Costa Barcelona. 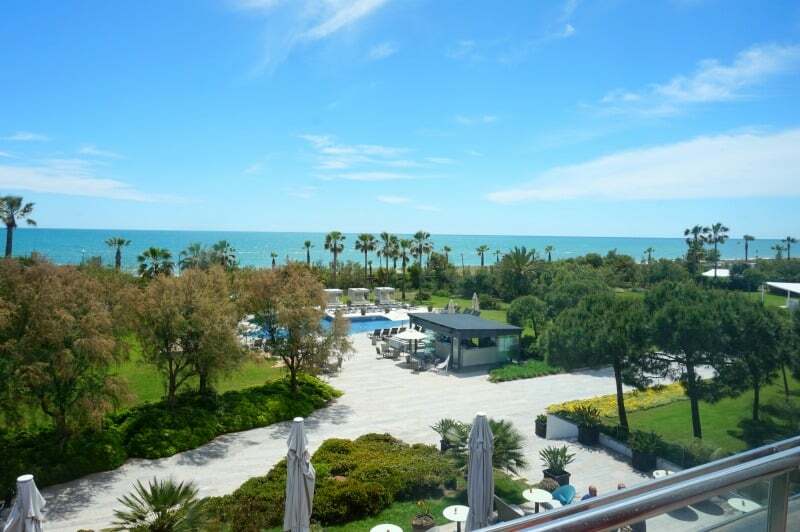 I was particularly impressed with my hotel room as it was an excellent size and the view over looking the pool and of the beach was just stunning. It made for a very pleasant stay indeed. If you watched my Instagram stories, you might have realised I was a little bit excited about it! Breakfast was served everyday at 7am and there was a lovely selection of pastries, breads, cereals, meats and cheese to choose from. There were also cooked options including fresh tortilla, tomatoes and mushrooms. We ate at the hotel every night, and the food was delicious on every occasion. Our meals included a selection of tapas, salads, fish dishes and local Catalonian desserts. We were spoilt to say the least, and it made for the perfect end to our days exploring the local area. One evening I was able to talk to our guide about the local cuisine, and he shared with me how there is a huge diversity of regional specialities across the country, so where ever you visit in Spain, you will always discover something new to try. On the first evening we were invited to the launch party at Kauai Gavà Mar for Costa Barcelona Week, which was set to be an exciting event to say the least. The bar and restaurant was a fun and vibrant setting for the evening. 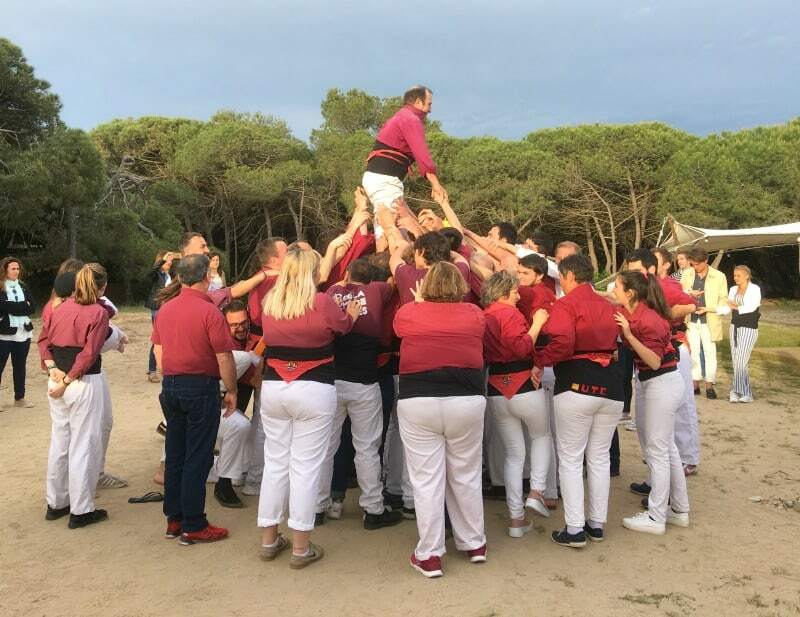 Cava flowed as we learnt more about the region, but the real highlight was being introduced to the local tradition of human tower building, known in Catalonia as Castells. I have never seen anything like the art of human tower building before and to see how the people work together to create the Castells is something I really think you should try to experience yourself. Castells are often found at festivals in the area and competitions are held every year to see who can complete the tallest Castell. Some reach 10 stories high, which I think is just mind blowing. Human tower building is the perfect introduction to Catalonian culture as it’s a real display of the sense of community and team spirit that exists in the area. Everyone is welcome into the group no matter how old you are, male or female etc. Children actively take part in this tradition often climbing to the very top of the tower to complete the structure. When I spoke with our tour guide about the Castells, he shared with me that every time he watches a Castell being treated it makes him feel very emotional, because of what they represent. I felt completely privileged to be able to see a Castell being created but I’ll admit I wasn’t brave enough to take part in this local tradition myself. Making wine and Cava is a huge part of the regions heritage and culture, and one of the best places to experience this is at Llopart winery situated in Sant Sadurní d’Anoia, which is apart of the Penedès region of Costa Barcelona. 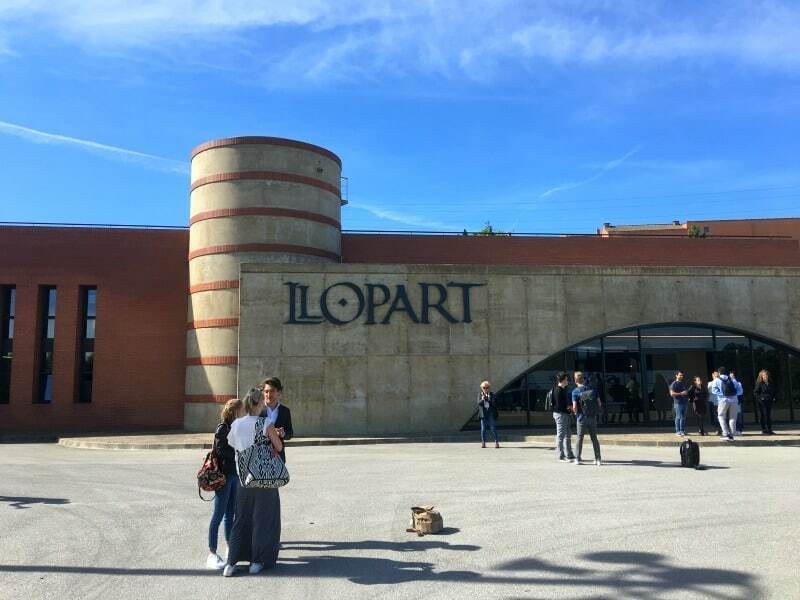 With around 765 wineries in the region, it could feel impossible to pick which one to visit, but I promise you won’t be disappointed if you call in at Llopart. As we drove up to the winery in the Mediterranean sunshine I was immediately impressed with the views of Montserrat, but there was so much more to come from our experience here. After learning more about the history of wine in the area, we explored the cellars of Llopart and of course got to taste some of their delicious Cava. 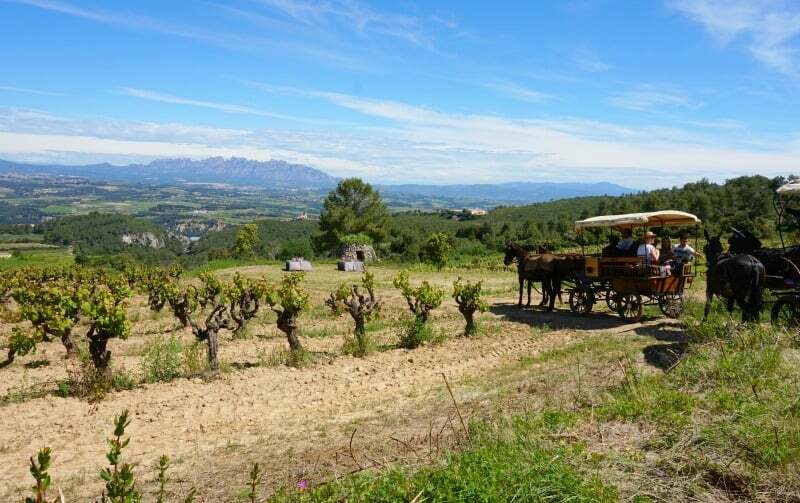 After the tour of the winery, we joined our horse and cart to take a ride to a more remote location surrounded by vines and and even more beautiful and uninterrupted views of Montserrat. This is an example of one of the experiences you can enjoy at Llopart, but they also offer helicopter tours and hot air ballon rides. Wouldn’t that be the perfect addition to some of the regions finest Cava! After more Cava and a selection of tapas, we ventured back down the hillside to have lunch at Mirador de les Caves where we were treated to yet more culinary delights, delicious local wines and outstanding views. I was very sad to have to leave this place, as I could have sat and enjoyed the rolling landscape all day given half the chance. If your Llopart experience leaves you wanting to explore more of Montserrat and it’s distinctive rocky peaks then these unmistakable mountains are also accessible by road through some incredible local scenery. 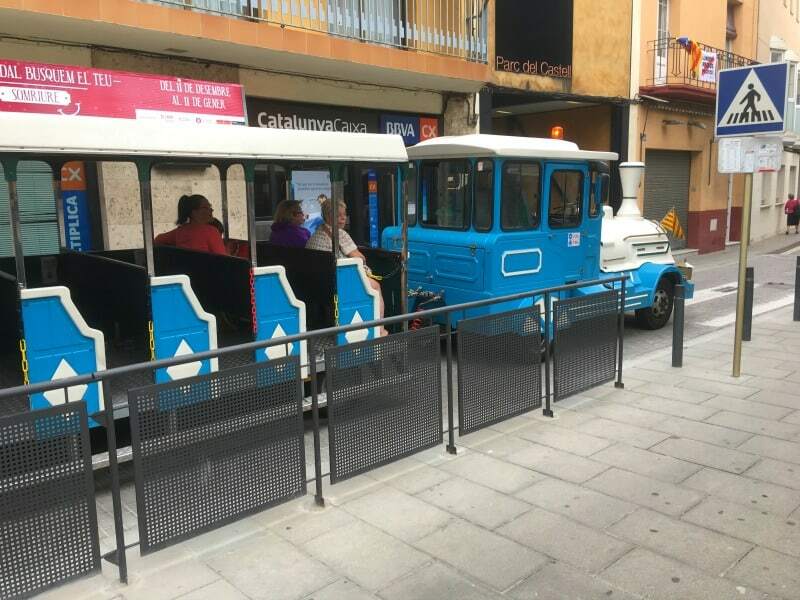 You can get even closer to Monserrat by taking the aerial cable car or the rack railway. As well as being an area of significant natural beauty, Montseratt also has a huge religious significance as it is the home to a statue of the patron saint of Catalonia, Our Lady of Monserrat as well as the associated monastery. Nothing makes me happier than wandering the streets of a Spanish town, and having a guided tour of Vilanova i la Geltrú is no exception. Now, Vilanova is a major fishing port, serving the local area and beyond. 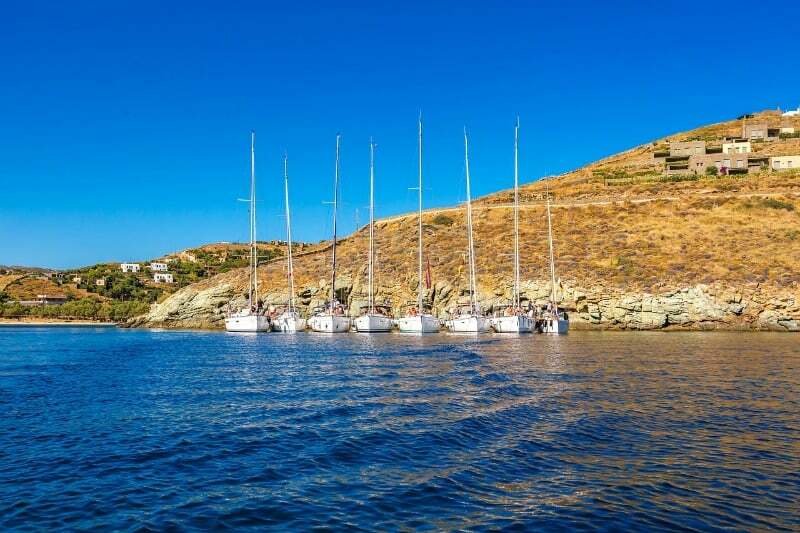 It’s also a place where you can enjoy a variety of water sports from sailing to kayaking and everything in between. If local history and exploring is more your cup of tea, venture into the Plaça de la Vila to enjoy the more opulent 19th Century architecture created in Vilanova during the Romantic period. Stroll a little further and you will also find one of the regions oldest museums, Víctor Balaguer Museum And Library which is home to some significant artworks from renowned painters such as El Greco and Rubens. Malgrat de Mar is a costal town in Costa Barcelona which that caters particularly well for families, with 4 beaches spanning 4 kilometres to choose from and is also named as one of the Catalan Family Holiday Destinations by the tourist board. This means that you should find family friendly facilities on the beaches and at restaurants you visit along side a welcoming attitude towards children to make for a perfect holiday. Malgrat de Mar also has a huge kids park, Parc Francesc Macia, that is accessible from the town via lift, if you are looking for a change of scenery or another location for a family picnic. Now, I will be the first to admit that I wasn’t sure what I was going to make of our visit to Circuit de Barcelona-Catalunya but it was one of those experiences where I actually came away pleasantly surprised by how much I enjoyed visiting here. 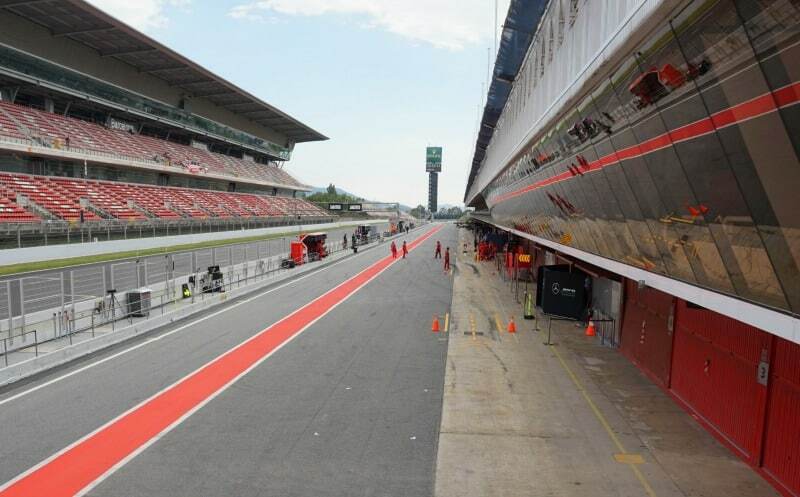 We were lucky enough to visit Circuit de Barcelona on the day of the F1 testing ahead of the Grand Prix. As we walked towards the track, the noise of the speeding F1 cars was pretty intense and passing the Ferrari, Mercedes and Aston Martin stations only added to the unexpected excitement I was feeling about the visit. The tour officially began in the press room where the F1 Drivers receive their official race briefing and the winner also gets to share their triumph with the press. Shortly after we headed out onto the viewing station and got to watch the cars in action. As I’m sure you can imagine, some of the F1 fans in the group were in their element but I think everyone was appreciating the excitement of the day. After a tour of the control room and main hub for journalists covering the race, we were escorted to some exclusive seats to get a closer view of the action. This was a real privilege as these seats are not sold to the public and we were able to get even closer to the cars which was super exciting. We have been treated to a thrilling afternoon for #CostaBarcelonaWeek! Watching the #Formula1 cars test ahead of the race at @Circuitcat_es was so cool ? If you are visiting Costa Barcelona with an F1 or racing fan I can strongly recommend taking a look at the Circuit de Barcelona website as they offer a range of different experiences as well as a number of races to go and watch throughout the season. If you are not a racing fan yourself, do not worry as I suspect you will end up having a fantastic day also. In complete contrast to the above, I would also add a visit to the Royal Monastery of Sant Cugat to your itinerary. 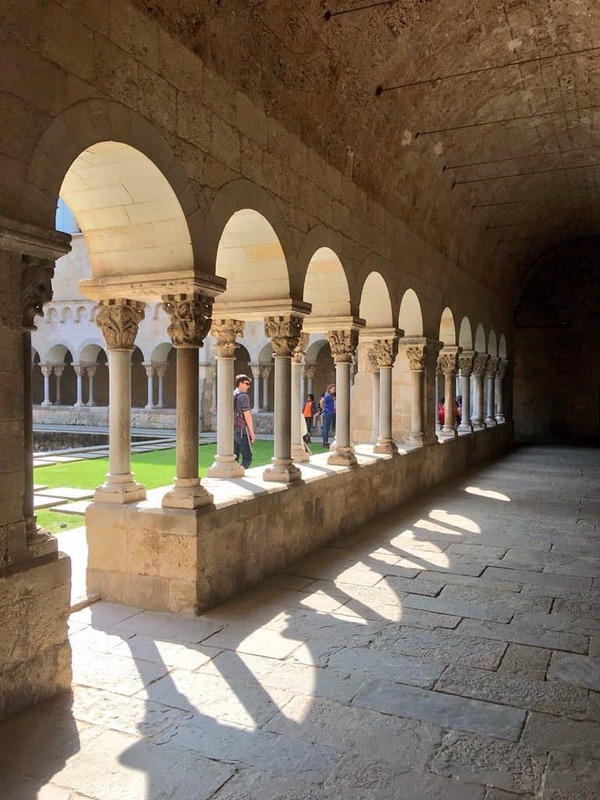 This medieval Benedictine monastery dates back to the ninth century and is incredibly well preserved. The Gothic stained window preceding over the square asserts the buildings significance and there is more to be learned in the Sant Cugat Museum adjoining which tells, amongst other things, how the building influenced the construction of other monasteries in the area. Sant Cugat is only 20 kilometres outside of the city of Barcelona and is the perfect day trip for learning more about the region. The local market takes place on Thursday next to the monastery and the town is brimming with restaurants and cafes for visitors to enjoy during their visit. 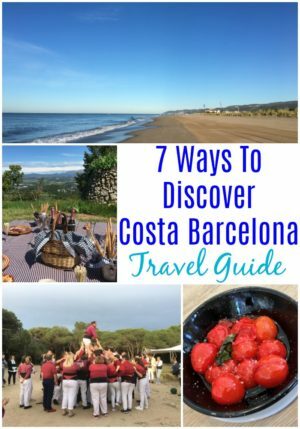 I hope this travel guide to Costa Barcelona gives you plenty of inspiration for things you can do to immerse yourself in this wonderful region of Spain. I certainly enjoyed all of the above activities and would love to go back to the area soon to see what else is on offer. 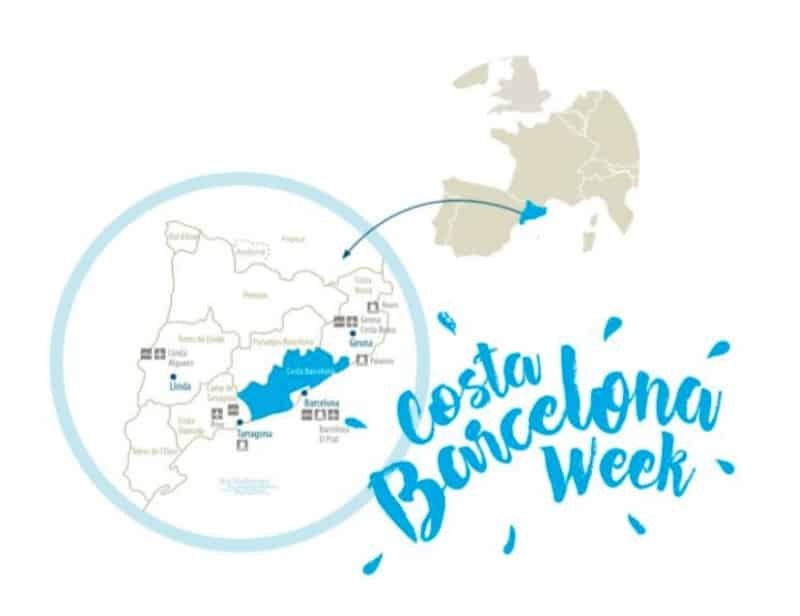 I was very kindly invited to Costa Barcelona Week by barcelonaismuchmore.com and Britmums to enjoy this press trip in exchange for sharing my experiences, but I have no hesitation what so ever in recommending a visit to this region to friends, followers or readers of Zena’s Suitcase. I really enjoyed seeing your updates on social media – it’s definitely an area of love to visit now! 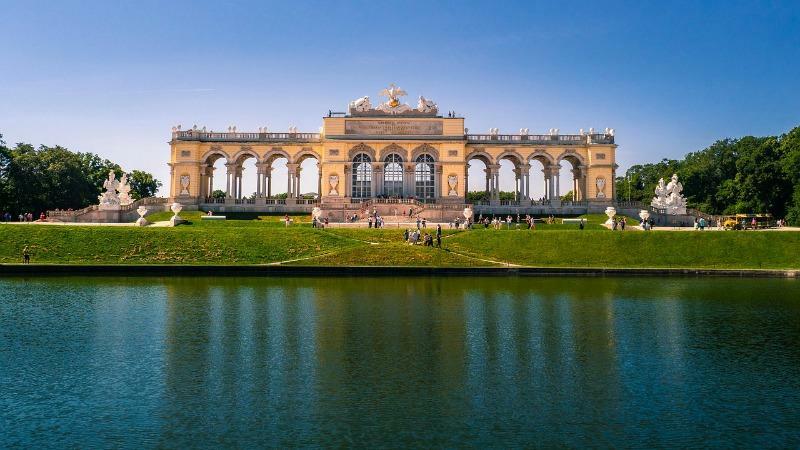 Such a beautiful region, with stunning food and wine. Well worth venturing beyond Barcelona itself. Barcelona region must be my favourite place in all of Spain. And Castells is something most unique about local tradition. I’d love to see the process and probably try it myself. However, I didn’t know tourists could easily get permission to partake? I’ve read the Castellers (people who actually build human towers) have regular training sessions to improve their skills. So not sure whether it’s a wise and safe venture for complete novices.